Hello everyone!! 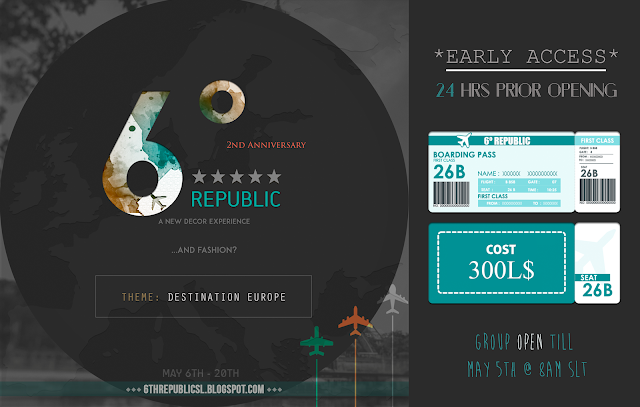 We are excited to announce that a new edition of 6 Republic is coming on May 6th, 2017 in celebration of our 2nd Anniversary. As always new stores are joining our family and a little spin has been made to our concept (details soon). The theme for this edition is DESTINATION: EUROPE where each designer gets to choose their prefer city as inspiration. Also, Early Access will be granted to the event 24hrs prior opening meaning on May 5th you'll be able to enjoy our unique shopping experience before anyone else. 4dc49a5d-d11a-a82c-912d-bfb21071cb76/about ) and pay the small fee of 300L. The group CLOSES on May 5th @ 8am SLT and there are limited spaces available so make sure to reserve yours now! Any questions please send a NC to 6Republic Resident. Great round, coolest theme, so exited!